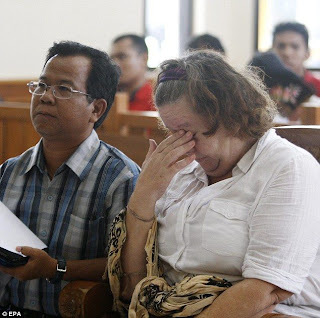 Lindsay Sandiford, 56 from Britain who was caught carrying £1.6 million worth of cocaine in her suitcase in Bali, Indonesia has been sentenced to death for drug trafficking. Although pleading guilty, she claimed she was coerced into the crime because her children were threatened. But in its verdict, a judge panel headed by Amser Simanjuntak concluded that Sandiford has damaged the image of Bali as a tourism destination and weakened the government's fight against drugs. Lindsay Sandiford, from Gloucestershire, was arrested in May last year following a routine customs check by police as she tried to enter Indonesia on a flight from the Thai capital Bangkok with £1.6 million worth of the Class A drug.